Ajax the Great was one of the greatest heroes of Greek mythology, one who came to prominence during the Trojan War, and stood shoulder-to-shoulder with other great heroes, including Achilles and Diomedes. Ajax the Great was a prince of Salamis, born to Telamon and Periboea. Heroic blood thus flowed through Ajax, for Telamon was a named hero who fought alongside Heracles and took part in the quest for the Golden Fleece and the hunt for the Calydon Boar. The uncle of Ajax was also a named hero, for the uncle was Peleus, and thus Achilles was Ajax’s cousin. Ajax the Great also had a half-brother, born to Telamon, who was Teucer, one of the great archers of the day. A story is told that before the birth of Ajax, Heracles was staying with his friend Telamon, when he offered up a prayer to his father, Zeus. ​Heracles prayed that Telamon would become father to a brave son, and when an eagle then appeared, it was a sign that Heracles’ prayers would be answered. Telamon then named his son Ajax (Aias) after the eagle (Aietos). It was said that as a boy Ajax was given into the care of the centaur Chiron for training; Chiron would indeed train many of the great heroes of Greek mythology, including Achilles and Asclepius. The reason why Ajax is not known simply as Ajax, is because during the Trojan War, there was a second named Achaean hero also named Ajax. Thus Ajax, the son of Telamon, became referred to as Telamonian Ajax, Ajax the Great, or Ajax the Greater, distinguishing him from Ajax the son of Oileus, who was therefore referred to as Locrian Ajax or Ajax the Lesser. Ajax the Great comes to prominence in the period immediately before the Trojan War, and in ancient sources it was universally agreed that Ajax was a Suitor of Helen. Helen, daughter of Zeus and Leda, was the most beautiful women of the age, and eligible kings and heroes from across Greece vied for her hand in marriage. To prevent bloodshed, the gathered Suitors of Helen undertook the Oath of Tyndareus, a promise to protect the eventual chosen husband of Helen; but Ajax, and the other suitors, would lose out to Menelaus when the choice was eventually made. Having undertaken the Oath of Tyndareus, Ajax the Great was duty bound to come to the aide of Menelaus, when the king of Sparta sought to retrieve his wife from Troy. This ensured that when the Achaean fleet gathered at Aulis, Ajax brought with him 12 ships of Salamineans. It was at Troy that Ajax was given his distinguishing moniker of “Great”, this was not necessary to show him as a superior warrior to Ajax the Lesser, although Ajax the Great was regarded as second only to Achilles in terms of warrior skills, but rather “Great” refers to his stature. Ajax the Lesser was of smaller stature to that of Ajax, son of Telamon, for Ajax the Great was the tallest of Achaean warriors, standing like a man mountain amongst the Greeks. Such was the size of Ajax the Great that he could be spotted on the battlefield from the ramparts of Troy. Ajax the Great possessed famous weapons and armour, but his most famous possession was his shield. Attributed to the work of the craftsman Tychius, the shield of Ajax was made from seven layers of bull’s hide, with an eighth layer of bronze, making it impenetrable to mortal spears. The shield was also enormous in size, and was of sufficient girth and height for Ajax and his half-brother Teucer to be protected, as Teucer shot his arrows from cover. It was common, during the Trojan War, to find Ajax and Teucer on the battlefield together, but Ajax was also often found fight side by side with Ajax the Lesser, with the pair referred to as the Aiantes. During the Trojan War, the greatness of Ajax was evidence by the fact that Hyginus credits the Achaean with the deaths of 28 named Trojan defenders. The weapon of choice of Ajax the Great was the spear, and amongst those dispatched by Ajax were Simoeisius, Glaucus and Lysander. Perhaps of greater importance than the number of heroes killed, was the fact that Ajax the Great was not aided in his fights by the gods, whilst the likes of Achilles, Diomedes and Odysseus had their divine benefactors. Ajax the Great would eventually marry a woman called Tecmessa, the daughter of King Teleutas, who Ajax took as prize when he ransacked her father’s city; Ajax would thereafter become father to two sons, Eurysaces and Philaeus. As the Trojan War dragged into its tenth years, Hector, the son of Priam, sought to bring the war to a close and challenged the Achaean heroes to single combat. It was something that Hector had proposed years earlier, when he had cajoled Paris into fighting Menelaus to bring the war to an end. Lots were drawn amongst the Achaean heroes, and Ajax the Great was thus chosen to face Hector. The battle between the two great warriors began at dawn, and lasted through until dusk. Neither Ajax nor Hector could gain the upper hand in the fight though, and eventually heralds called an end to hostility, at which point the two heroes exchanged gifts, Ajax presenting Hector with a sword belt, and Hector giving Ajax a sword. In the tenth year of the war, Achilles was absent from the battlefield following an argument between Achilles and Agamemnon. During this period the Trojans began to get the upper hand in hostilities, and Agamemnon then tried to convince Achilles to return to the war. At one point Ajax, along with Phoenix and Odysseus, were sent to plead with Achilles, and although Ajax spoke well, and the fact that Achilles and Ajax were lifelong friends, as well as cousins, Ajax could not change Achilles’ mind. Ajax the Great was more at home on the battlefield than in diplomatic circles, and the strength and skill of Ajax was never more needed. The attacking Trojans, taking advantage of the absence of Achilles, threatened the beached ships of the Achaeans. Ajax the Great was one of the few defenders who stood between the Trojans and the ships, and ultimately Ajax and Hector would meet again on the battlefield. By throwing a gigantic stone, Ajax managed to knock Hector unconscious, but Hector soon recovered his senses, aided by Apollo, and in the next battle between Hector and Ajax, it is Ajax who is sent into retreat when he is disarmed. Patroclus, in the armour of Achilles, would then enter the battlefield, aiding Ajax in the fight. Patroclus would kill many, but ultimately he was killed by Hector, and the armour of Achilles was stripped from the body. 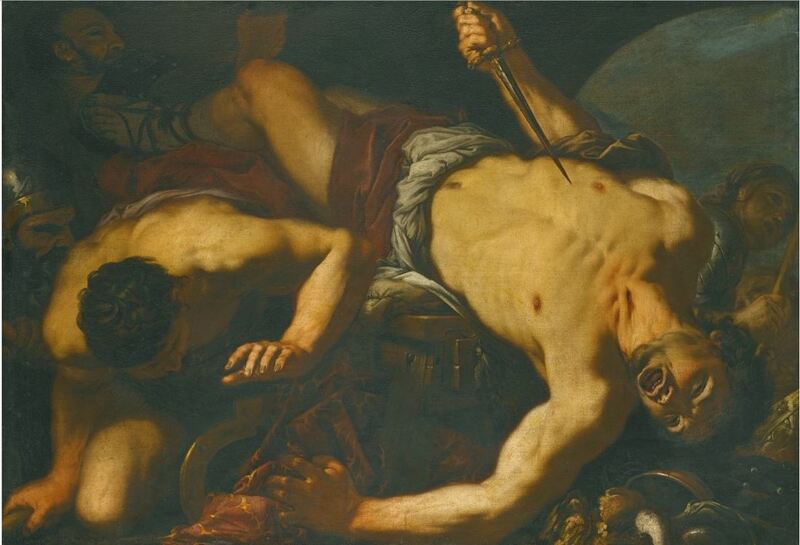 The body of Patroclus would have been desecrated, but at that point Ajax the Great, along with Ajax the Lesser, come to defend the body of the Achaean hero. Then whilst Meriones and Menelaus carry the body of Patroclus from the battlefield, it is the Aiantes who defend against the Trojan army. The death of Patroclus succeeds where the words of Ajax the Great had failed, and now Achilles re-joins the battlefield. Soon though, Ajax the Great once again has to rescue the body of one of his comrades, for Achilles has fallen to the arrow of Paris. Ajax now carries the body of Achilles from the battlefield, whilst Odysseus defends against the Trojan army. The death of Achilles now brings dispute amongst the Achaean heroes, for an argument erupts between Ajax and Odysseus about who should now possess the Hephaestus wrought armour of Achilles. The armour of Achilles should by rights have gone to the next greatest of the Achaean heroes, and in truth, Odysseus was several steps down from being the greatest. Ajax had his battlefield honours, including the rescue of the bodies of Patroclus and Achilles, and the defence of the Achaean ships, Odysseus though, was eloquent, whilst Ajax was not, thus the words of Odysseus managed to convince the judges, most notably Agamemnon and Menelaus that the armour should be his. Some say that the argument between Ajax and Odysseus was not over the armour of Achilles, but of ownership of the Palladium, but the result in both cases was the same. Ajax the Great would take the decision of the judges as a great insult, and now plot against his former comrades, and plans to go to war with the other Achaeans. Athena, a protector of Diomedes and Odysseus, then clouds the mind of Ajax the Great to such an extent that he now thinks that the cattle and sheep kept near the Achaean camp, are Achaeans, and so Ajax slaughters them. Eventually the cloud clears from Ajax’s mind, and now observing what he has done, Ajax cannot live with the shame, and so falls upon his sword, the very sword given to him by Hector. The body of Ajax the Great would be cremated, and the ashes of the Achaean hero placed into a golden urn. The tomb of the Ajax was then constructed at Rhoiteion upon the Troad. This burial though did not sit well with Telamon, the father of Ajax, and when, after the end of the war, Teucer returned to Salamis without the body, or armour, of his half-brother, Telamon rejected his other son, and refused Teucer leave to set foot on Salamis again. Death is not the end to the story of Ajax the Great in Greek mythology, for Homer, in the Odyssey, has Odysseus spying Ajax in the Underworld. Odysseus is said to have a great sense of remorse about the death of Ajax, wishing that his former comrade had taken the armour of Achilles instead of himself, but Ajax still hold a grudge, turning his back on Odysseus as he comes near. It was subsequently said that Ajax the Great was to be found upon the Isle of the Blest, part of Elysium, and the equivalent of paradise in the Greek underworld. There, Ajax was to be found alongside the likes of Achilles, Ajax the Lesser and Patroclus.